Description: Nothing like elevated curves. Description: BNSF Alliance Yard. Inbound Power from O-ALTALT1-14, Outbound Power for Z-ALTWSP2-15 - ETMS Unit. Description: Quite the great consist for todays power. three paint schemes, three locomotive models, three ending in a 7, and two locomotive builders. Plus there all elephant style. Description: Manifest heading into the yard on the main. Description: A BNSF Vehicle Train heads east over the KCT Argentine Connection flyover as Amtrak Train 311 wyes at BN Crossing and flips to become Amtrak Train 316 to St. Louis this evening. Description: Two BNSF diesels lead a hopper car train south through Norman. Description: Led by BNSF 5505 and stopped at Gribble Siding to meet a southbound manifest. Title: BNSF 5241 meets BNSF 5505 and the 634 Job at Gribble Siding. 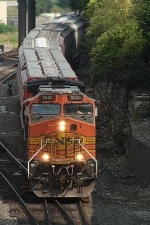 Title: BNSF 5505 leading the 634 Job north. Description: The 634 Job heads north with a Warbonnet A/C unit on the lead Dash 9.